This calendar commemorates the 20th anniversary of John Davidson’s walk across Canada in 1998. 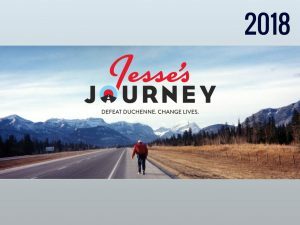 The walk, titled Jesse’s Journey: A Father’s Tribute raised significant awareness and over $2 million for Duchenne muscular dystrophy research, and created the Jesse Davidson Endowment Fund – a fund that will generate revenue for research in perpetuity, until a cure is found. Join Jesse’s Journey in 2018 as we celebrate and honour the last 20 years of hope and innovation. All proceeds from the sale of this calendar support crucial Duchenne muscular dystrophy research.